Dramatic dark dust knots and complex structures are sculpted by the high-velocity stellar winds and high-energy radiation from the ultra-luminous variable star called Eta Carinae. This image shows a region in the Carina Nebula between two large clusters of some of the most massive and hottest known stars. 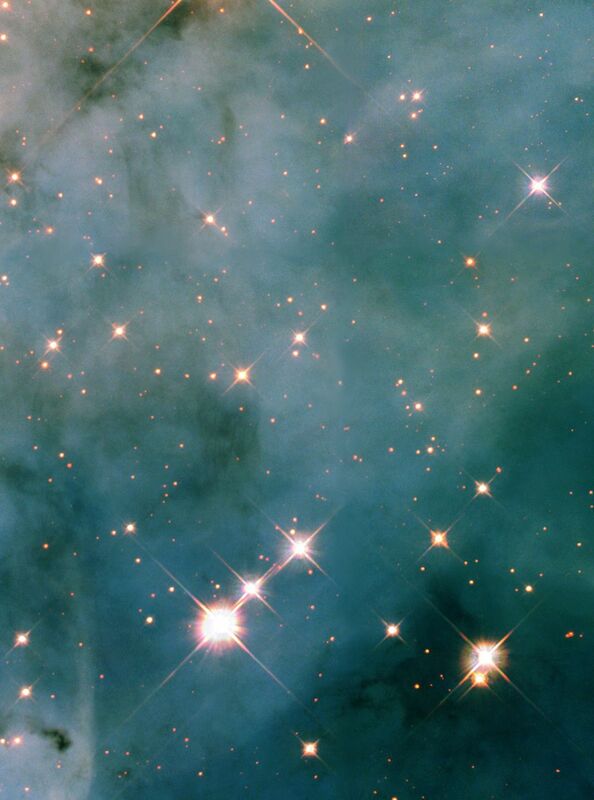 This NASA Hubble Space Telescope close-up view shows only a three light-year-wide portion of the entire Carina Nebula, which has a diameter of over 200 light-years. Taken with Hubble's Wide Field Planetary Camera 2 in July 2002, this color image is a composite of ultraviolet, visible, and infrared filters that have been assigned the colors blue, green, and red, respectively. The Carina Nebula, a naked-eye feature of the Southern Hemisphere portion of the Milky Way, resides at a distance of 8,000 light-years. The nebula has a diameter of over 200 light-years. This close-up view is only a three light-year-wide portion of the entire nebula. The Carina Nebula contains the famous explosive variable star Eta Carinae, or Eta Car. 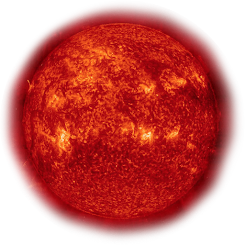 It contains as much mass as 100 suns, and puts out more energy each second than 1 million suns. Eta Car was one of the brightest stars in the sky for southern observers in the 1800s, but it has since faded. It may continue to experience future outbursts, which may increase its brightness again at some point. The filamentary structure visible in images of the Carina Nebula is caused by turbulence in the circumstellar gas, which in turn was caused by several stars shedding their outer layers. Cold gas mixes with hot gas, leaving a veil of denser, opaque material in the foreground. Dramatic dark dust knots and complex features are sculpted by the high-velocity stellar winds and high-energy radiation from massive and energetic stars in the nebula, such as Eta Car. When massive stars like Eta Car shed their outer layers, the chemical elements in the surrounding area create a potential reservoir for new star formation. Many elephant-trunk shaped dust clouds are visible throughout the Carina Nebula. These clouds may form into embryonic solar systems.